For ultimate power transmission from the skier to the ski. Constructed for performance to allow for better control quicker response particularly at higher speeds. 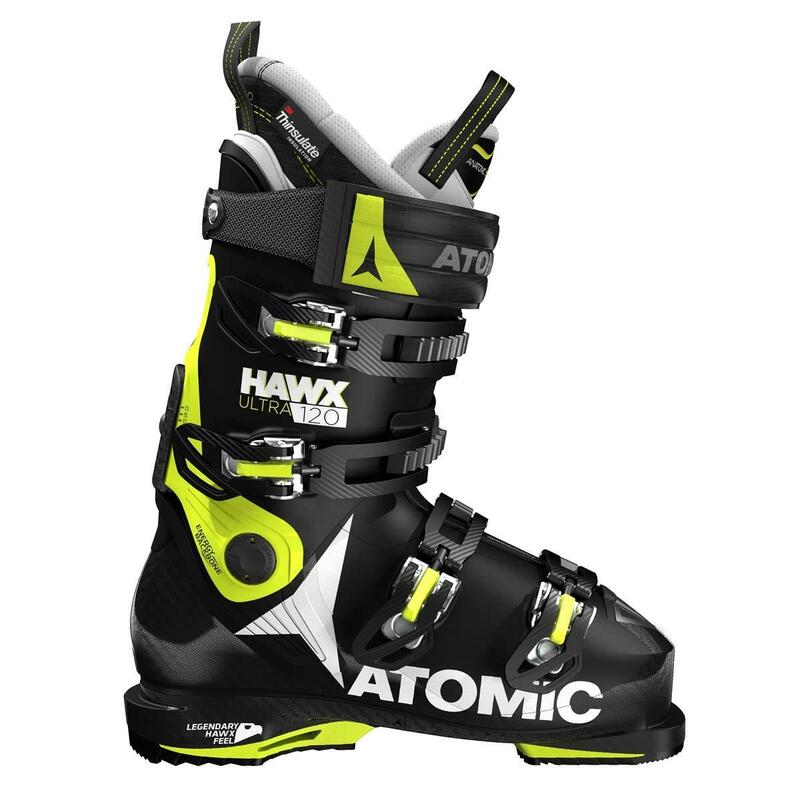 If you’ve got narrow feet and you’re looking for a sporty and lightweight all-mountain ski boot, the Atomic Hawx Ultra 120 could be the one. It’s a top hard-flexing Hawx Ultra boot – a new range with the legendary Hawx feel in a narrow 98mm last. It comes with Memory Fit for the personalized fit of a custom ski boot in minutes, and a Memory Fit 3D Platinum liner with pre-shaped heel and ankle areas for an even better first fit. It is also the lightest alpine boot range we’ve ever made! The reason it’s so light yet powerful: a radical new Progressive Shell that adds reinforcement in key zones but reduces wall thickness overall to cut weight, combined with our Energy Backbone – a reinforced, asymmetric backbone that provides extra strength and edge grip for strong skiing. These boots also feature Power Shift, Cuff Alignment and our new Cantable Grip Pads, making them some of the most customizable boots to date. Pros: Adaptable to skier preference. Cons: not for the super large volume foot. The memory fit system on these boots is amazing. If you have a narrow heel and wide forefoot, it is so easy to gain width in the front. Most problems spots just disappear when molded. Snug but comfy fit light weight and adjustable forward lean. These boots are so light you won't have any problems getting around the mountain when you need to take your skis off. They're warm, comfortable, and handle well. Cons: Hinge rivet broke at about 100 days of skiing. Pros: Warm, light and comfortable!! Atomic has outdone themselves this year. This boot is a must have. The well known Atomic Hawx just got even lighter! A very versatile boot that stays warm and will preform season after season. this is one of the lightest boots on the market but still very comfortable. This is the lightest boot I have ever worn. Great option for an advanced level skier who wants a nice, snug fit. The Hawx Ultra is the best ski boot I have ever owned. The new lightweight shell is immediately noticeable from the first time you pick it up. But it does not stop there as the boot performs like a race boot. But wait there is more.. the new Memoryfit shell and new liner offer comfort like your favorite pair of slippers. Atomic hit one out of the park with this boot! Super comfortable, very light, and great connection with any ski. If you haven't held one yet I strongly recommend that you do. I love the heat moldable shell. If these boots were not comfortable enough from the factory, they get more comfortable when they actually mold to your feet. These are also the lightest boots I have ever put on my feet. This was the sealing deal for me purchasing them! Keep it up Atomic!! Pros: A POUND AND A HALF LIGHTER! Coming in at a pound and a half lighter, this boot is sure to be a game changer while still delivering the performance and fit that the Hawx series has come to be known.